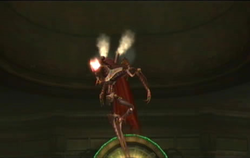 Steamlords are humanoid machines that appear as enemies in Metroid Prime 3: Corruption. They are Elysians that were infected with Phazon Corruption by the Leviathan launched by Dark Samus. Three Steamlords appear throughout the game, all on Elysia's SkyTown facilities. These Elysians, built by the Chozo, seem to have been made with the purpose of repairing fallen attack bots such as Tinbots and Steambots. Samus encounters them in three locations within SkyTown: the Steambot Barracks, Skybridge Hera, and the Ballista Storage. Each encounter is progressively easier. The first Steamlord that appears serves as a miniboss. Before attacking, this Steamlord appears to follow or lead Samus through the pods of Skytown. In these appearances, it is intangible and invulnerable to Samus's Beams or Missiles. During the battle, this Steamlord commands Steambots. It allows the Steambots to attack while it floats around, invisible. Samus can only damage it if it stops to repair a damaged Steambot. A second Steambot appears on the Skybridge Hera, but Samus can simply choose to ignore it and cross the bridge. The bridge immediately falls, dooming the Steamlord and its subordinates. The final Steamlord appears in the Ballista Storage, where the Boost Ball was previously obtained, when returning to the location in order to retrieve an Energy Cell. This appearance is much easier, as Samus will have possession of the X-Ray Visor, allowing her to damage it throughout the battle. Steamlords command the worker drones of SkyTown. They also repair them when they malfunction or break down. Lightly armored, they rely on their cloaking field to evade their enemies. They can generate localized EMP fields to hinder enemy visor systems. This page was last edited on 23 October 2012, at 15:34.